As a local business we feel strongly about giving back to our local communities and supporting the people who live in East Renfrewshire. 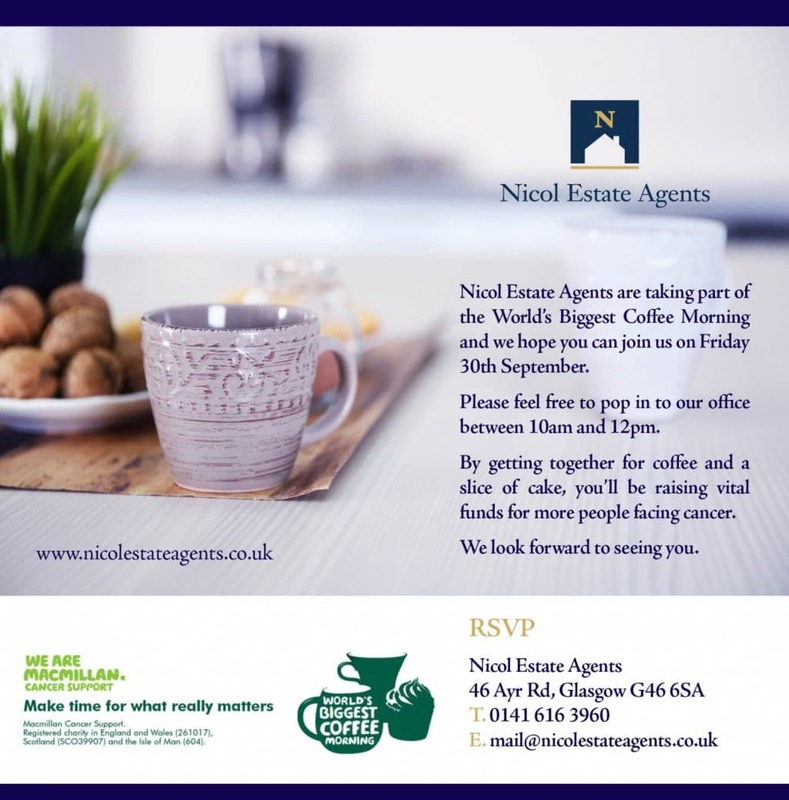 We are delighted to announce Nicol Estate Agents are taking part of Macmillan’s “World’s Biggest Coffee Morning”. The World’s Biggest Coffee Morning is Macmillan’s biggest fundraising event for people facing cancer. Last year alone Macmillan’s raised £25 million and this year they are aiming to raise even more. That is why we feel having a Coffee Morning in our office is the perfect chance to catch up over a cuppa and a slice of something delicious while still supporting a great cause. We are hosting our Coffee Morning on Friday, 30th September 2016. You are more than welcome to pop in to our office between 10am and 12pm. By getting together for coffee and a slice of cake, you will be helping raise vital funds for more people facing cancer. We look forward to seeing you. Please just drop us a line at mail@nicolestateagents.co.uk confirming your attendance.